In response to Apple users demands Aleratec Launches 1:16 USB 3.0 Copy Cruiser Mini Duplicator for both Mac and Windows. Now right out of the box, without any special configuring, Mac users can easily duplicate flash drives in an environment they know. Aleratec Inc., award-winning designer, developer and manufacturer of Portable Device Management (PDM) charge/sync products for mobile devices and professional-grade duplicators for hard disk drives, USB flash drives and DVD/CD discs, launched today a new software update for the 1:16 USB 3.0 Copy Cruiser Mini duplicator that now allows compatibility with Mac OS X computers and laptops in addition to Windows 10/8/7/Vista platforms. Responding to requests from customers who use MacBooks and iMacs to distribute information via USB thumb drives, the new software will be included with all 1:16 USB 3.0 Copy Cruiser Mini duplicators and upon verification, existing customers who already own an eligible Aleratec USB duplicator can also receive the new software update at no charge by contacting Aleratec customer support at +1-818-678-0484. Aleratec’s 1:16 USB 3.0 Copy Cruiser Mini (Aleratec P/N 330115) has an estimated Retail Price (ERP) of $499 and is available from Aleratec's dedicated resellers and distribution. Also available with the Mac software is the 1:22 USB Copy Cruiser Mini (Aleratec P/N 330119). 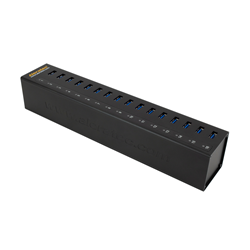 For more information on Aleratec’s Mac-compatible USB duplicators, visit aleratec.com/usb-duplicator.html. The full line of Aleratec solutions and accessories is also featured at Adorama, Amazon.com, B&H Photo Video, Barnes & Noble, Best Buy, CDW, Global Industrial, HP, Insight, MacMall, Media Supply, Newegg, Office Depot, PC Connection, PCM, Quill, Rakuten, Sam’s Club, Sears, Staples, Target and Wal-Mart in addition to other leading US retailers. Government and education customers may purchase from Government and Education Specialists including B&H Photo Video Gov, CDW-G, GovConnection, PCM-G, Shi.com, Softchoice, SoftMart, and Sparco.com. All products are available to resellers in the U.S. through D&H Distributing, Ingram Micro, and Tech Data; in Canada through Ingram Micro Canada and Tech Data Canada; in Latin America and Mexico through Tech Data; in the EMEA (Europe, Middle East, Africa) region through Ingram Micro UK. Aleratec designs, develops and manufactures high-performance products acclaimed for their reliability and ease of use. Beginning in 2000, California-based Aleratec has met the needs of professionals in education, government and corporate markets with a diverse product line that includes professional-grade portable device management (PDM) charge/sync products for tablets and other mobile devices, duplicators for hard disk drives, USB flash drives and DVD/CD discs, as well as shredders, disc repair and related accessories. For more information, please visit http://www.Aleratec.com or contact us toll free at 866-77-ALERATEC (866-772-5372). You can also follow Aleratec at google.com/+AleratecInc, YouTube.com/Aleratec, Twitter.com/Aleratec, Facebook.com/Aleratec and Blog.Aleratec.com.